Athens, 30th August 2016. 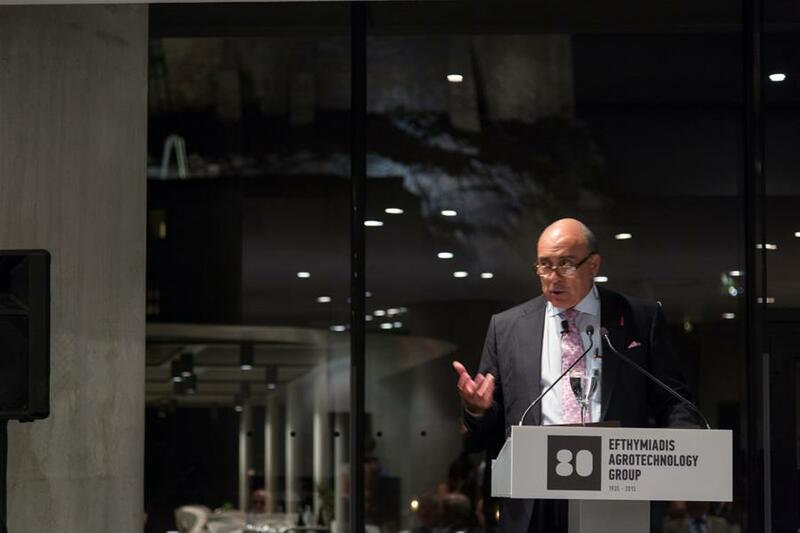 With a prestigious event that took place in the breathtaking Acropolis Museum, the Efthymiadis Agrotechnology Group reached the culmination of its 80th anniversary celebrations, honored by the presence of leading representatives from the political, economic, business and diplomatic spectrum, together with a remarkable number of foreign entrepreneurs. 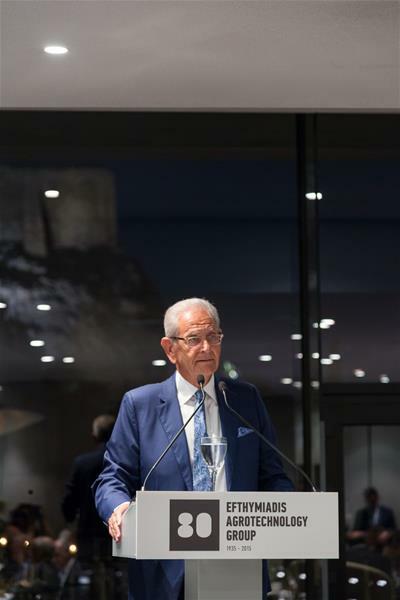 In his opening words, the president of the Group Mr. Nikos Efthymiadis referred to the ethical and business values which guided the business throughout its history and expressed his deep personal emotion for successfully steering the Group through troubled waters for nearly half a century. He pointed out that the agrotechnology sector has saved more lives than medicine itself in the last century, being the main contributor to the dramatic rise of world life expectancy from 33 years in 1900 to 71 today. Speaking about the future, he emphasised that, as the world population will increase to 9 billion by 2050, only 35 years remain for food production to be increased by approximately 50%. He pointed out that to achieve this monumental goal, agrotechnology must drastically increase the yield of the earth’s current agricultural land without depleting natural resources and adversely affecting the environment. Finally, he asked those present tο spread the word to their countries that Greece still has a number of efficient and productive sectors of the economy which are in a position to restore social balance and national pride. The extensive discussion that followed on the role of the multinationals in a period of increased international economic diversion was chaired by Alexis Papahelas, with the participation of the CEOs of Coca-Cola Mr. Muhtar Kent and of Dow Chemical, Mr. Andrew Liveris. Mr. Kent stressed the need for the multinationals to support the countries in which they operate by actively buying, producing and distributing locally, while also fairly contributing to tax revenue. 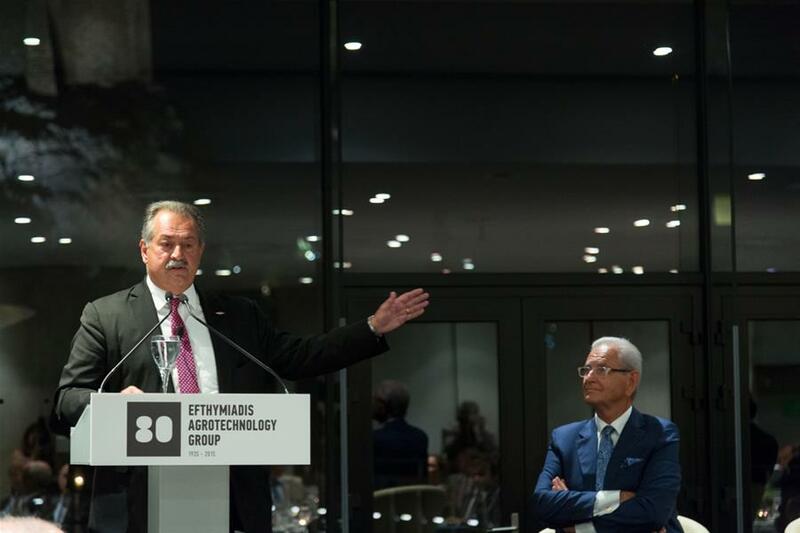 At the same time, he praised the business strategy of those Greek enterprises, such as the Efthymiadis Agrotechnology Group, who consistently try to maximize local value added at a time when most companies simply manage brands or offer services. 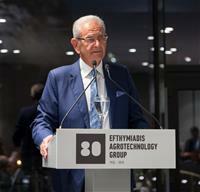 The company which has evolved into the Efthymiadis Agrotechnology Group was founded in 1935 by Efthymios Efthymiadis. Today it employs 420 people with subsidiaries in 8 countries and is active in the sectors of agricultural supplies, plant propagation material, laboratory services, environmental analyses, greenhouse management and the production and distribution of branded, high quality agricultural produce. In 2015 the annual turnover of the group amounted to 60 million euro.